Great photo Mike! how did you get so close? Were you using a 500mm telephoto for that? Ya see, truth be known, the poor feller's name is Tonkatsu and he was in a covered pen and camera shy. I hadda hang my over the fence and guess where he was gonna run to next before firing. 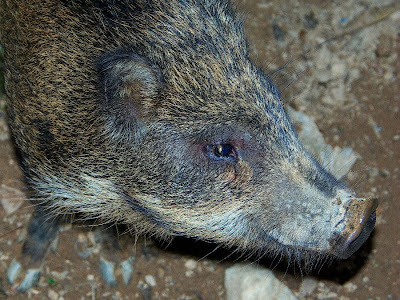 It was pretty WILD for me, so, I called him a Wild Boar ! Didja CLICK on my You Live Near Okinawa Gadget by any chance?